Identify and fill your cyber skill gaps with 100s of IT and security courses from Infosec. From certification boot camps to competency-based skill courses, we can help sharpen your skill set and advance your career. All courses are delivered via your Infosec Flex Center, so you can train anywhere on your favorite device. The CISSP Learning Path offered by Infosec Institute's Infosec Flex program is second-to-none. They provide an ample amount of pre-course work to get you ready. The training course I engaged in for my CISSP was remote and led by an extremely seasoned and talented instructor. This instructor was able to thoroughly cover all of the necessary topics in each CISSP domain, and relate real-world experiences to those teachings. The method was extremely effective. All-told I put in around 70 hours of training-work the week of the course. You get a lot of homework, and be sure to do your homework after class, not during. Several fellow students who struggled with the exam were doing homework during class. If you do fail the exam the first time, they have a re-take voucher which you can qualify for. They are truly invested in your success and it shows. There was nothing I disliked about the program. It was hard, but I knew that going in due to the breadth of content. Great company to work with. They offer re-take guarantees and you can often sit and audit their classes once you go through them. I found that they often also offer alumni discounts for other cources. The skills I refined while working with the Infosec Flex Pro program enabled me to have a more-complete security focus on my day-to-day thought leadership activities. The course was enough to fill out my knowledge in all CISSP domains to become certified. "Comprehensive Material Coverage with Highly Knowledgable Instructors"
Although the Learning Portal site leaves a little to be desired design-wise, the materials and track for learning provided is useful both for real world use case and application of knowledge as well as including information covered in a certification in a comprehensive way. What Technical Skills Development solution do you use? "I like the platform. " I like the flexibility that it offers. It allows me to attend my boot camps from my home and not have to worry about traveling to attend in person. The first boot camp that I attended I was mailed hard copy material. I like having physical books that I can carry around and make notes on. During my last boot camp I was only given access to digital courseware that you weren't able to print and it was looked to one computer. I wanted to be able to attend boot camps but they weren't offered where I am located. My job wouldn't pay the cost for me to travel to a boot camp. This allowed me to attend the boot camp. "Easy to Use and comprehensive learning program"
* We monitor all Infosec Flex reviews to prevent fraudulent reviews and keep review quality high. We do not post reviews by company employees or direct competitors. Validated reviews require the user to submit a screenshot of the product containing their user ID, in order to verify a user is an actual user of the product. Hi there! 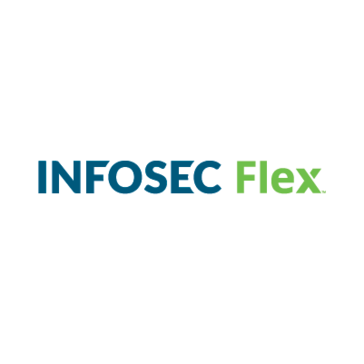 Are you looking to implement a solution like Infosec Flex?